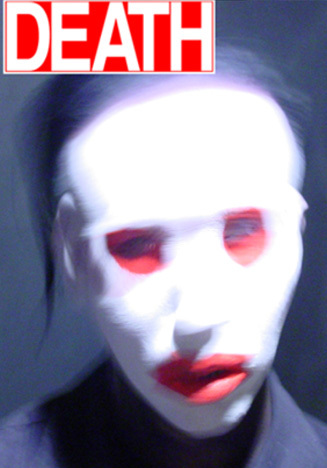 April 21st, 2006 : New Incarnation of MarilynManson.com. In collaboration with Brad Jaeger, who along with me painstakingly compiled and documented all information herein. Just a day after seven years had passed since the tragedy that took place in Colorado which Manson was virtually solely scapegoated for allegedly inspiring, the subject of Celebritarianism was again revisited, marking the new evolution of MarilynManson.com. 1. a. A fantastic sequence of haphazardly associative imagery, as seen in dreams or fever. And this definition is precisely what MarilynManson.com acted as a pure illustration of phantasmagoria being an instantaneously flashing of 26 images with a superimposed MM atop; images which are elements of film projects Manson has alluded to, images which reflect the concept of Celebritarianism further discussed below; images both cryptic and disturbing; along with images hinting at the very inspiration behind the original concept of Marilyn Manson. The audio file playing is (as predicted by The NACHTKABARETT last January in the first series of changes on MarilynManson.com) one of the few existing audio recordings of Aleister Crowley, this is particular being Crowley's recitation of the 'The Call of the First Æthyr (Enochian Version)'. Compilation of the few existing Aleister Crowley recordings, including 'The Call of the First Æthyr', the Enochian version of which is the anguishing gibberish that can be heard in Manson's infamous phantasmagoric intro. 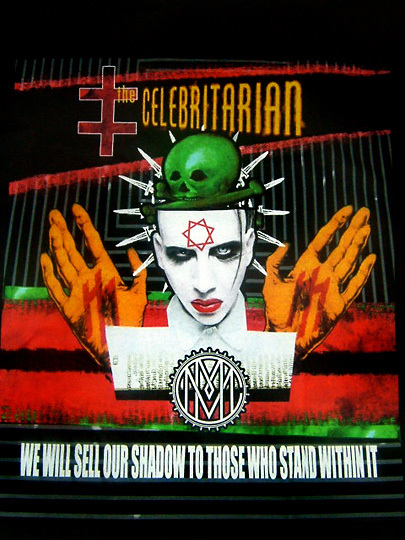 Brand new Celebritarian t-shirt depicting Marilyn Manson, a la Charles Manson, with the seven pointed Star of Babalon emblazoned on his forehead coinciding with many of the recent Occult & Enochian references by Manson. A fitting allusion as references to Crowley and specifically Enochian magick date to the back cover of Holy Wood where a jawless Manson is depicted in front of the Sigillum Dei Æmeth, as stated previously on The NACHTKABARETT, a symbol delivered to Edward Kelly and Dr. John Dee in the Sixteenth century, both of whom working together laid the foundation, through divine guidance, of the present system of Enochian Magick which is considered to be one of the most powerful forms of magick by many Occultists. 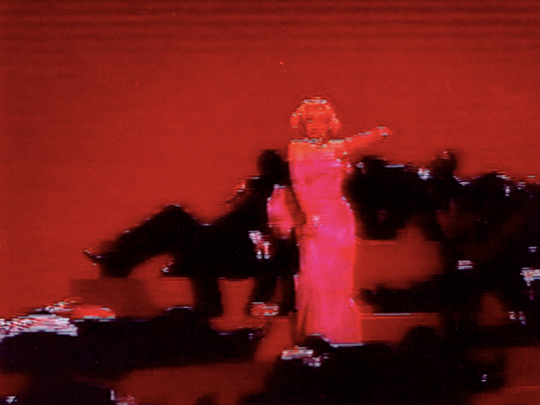 Still frame from MarilynManson.com flash intro which appears to be a distorted frame of Marilyn Monroe singing "Diamonds Are A Girl's Best Friend". Marilyn Monroe singing "Diamonds Are A Girl's Best Friend". 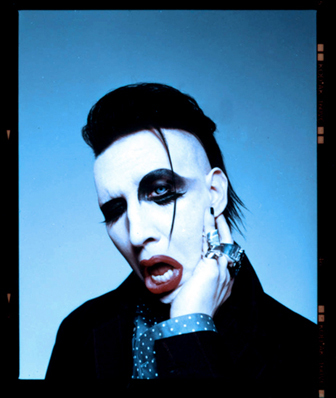 Marilyn Manson circa. 1994. An early allusion by Marilyn Monroe by Manson. 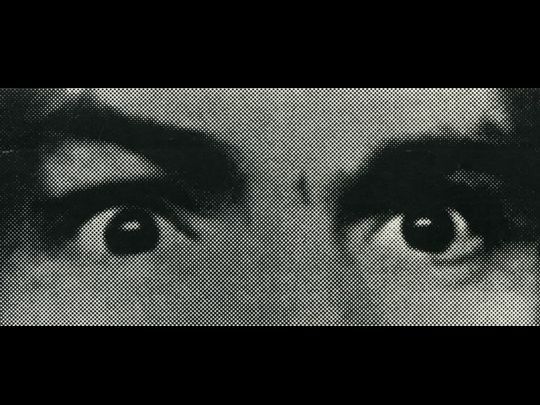 Another short note to make mention of is that of the two sets of eyes which can be seen independently in the flashing series of images. 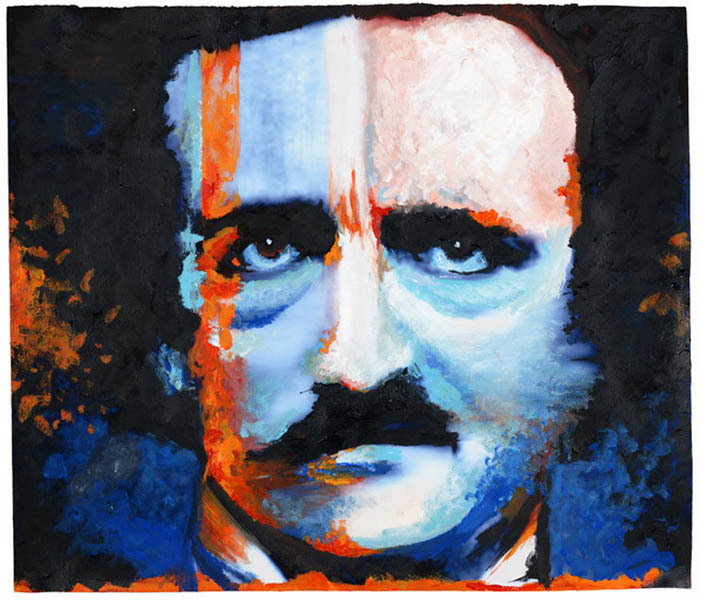 These are none other than those of Marilyn Monroe, and Charles Manson, two of the biggest iconographic figures of the 1960's, and the inspiration for the name which Manson adopted. 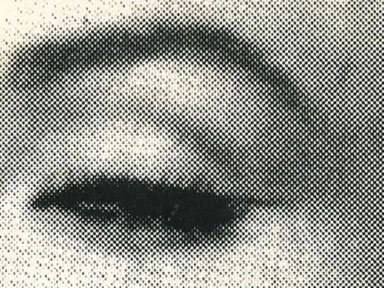 in which Andy Warhol painted his famous Marilyn Monroe silkscreen montage shortly after her suicide. 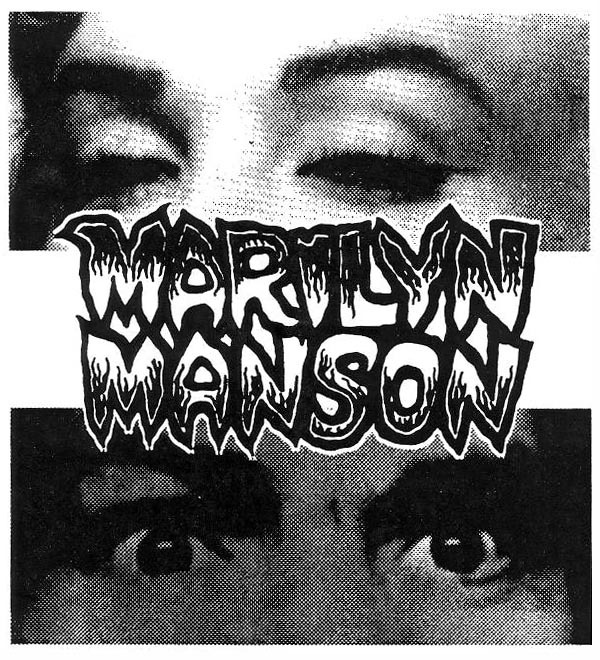 Early Marilyn Manson 1990s concert flier. Image courtesy of SpookyKids.net. as a ghoulish clown in what looks like a parody of LIFE Magazine. 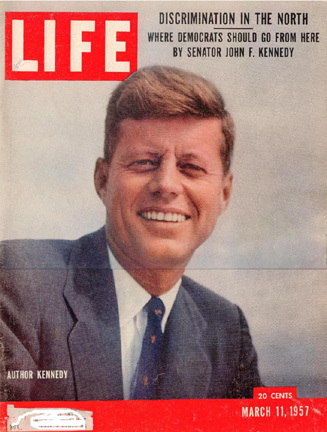 LIFE Magazine - a publication which has displayed some of the most influential characters of the 20th century, many of which have been previously referenced by Manson as to having provided him with inspiration for his albums. 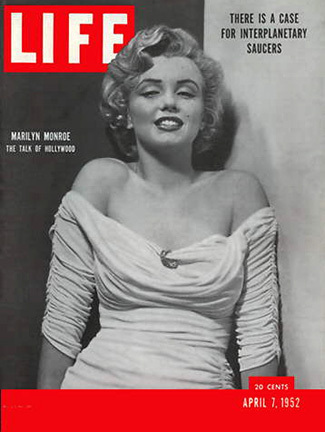 Marilyn Monroe, Charles Manson, and JFK, are but three of the figures LIFE has displayed on its historic covers. The concept of Celebritarianism is directly applicable, as all three were turned into martyr's of sorts. Monroe and Manson represented two of the largest icons of the 1960's, and in the case of Monroe and JFK, their fame was widely increased and perpetuated by the circumstances of their death (while Manson's was perpetuated by the death he caused to others). Thus the initial concept of Celebritarianism was born: the devouring of celebrities, the juxtaposition of popularity and recognition onto death, and conversely, being unknown or 'nobodies' while alive. 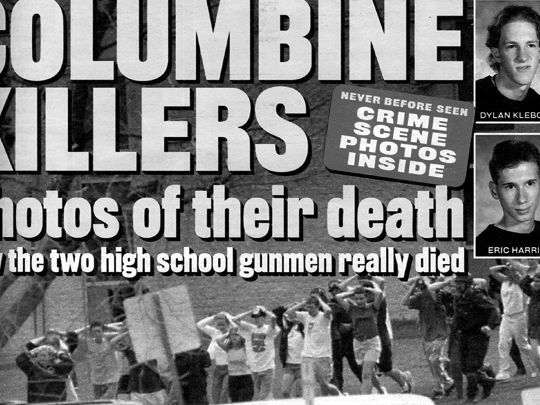 The dead, regardless of their LIFE, are recognized, idolized, and worshiped upon their DEATH, and are subsequently (and humorously) martyred and placed onto magazine covers such as LIFE. As with the universal concept of balance; present within every form of dichotomy, the two opposing forces (for example: LIFE and DEATH) are not per say pitted against each other, but rather are the union of opposites. Manson's most recent reference to this notion being the Celebritarian Double Cross. 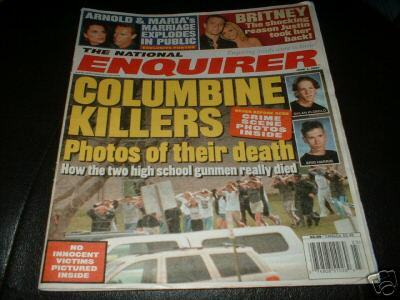 With one still photograph in a flurry of images being displayed in the new update, that of a tabloid magazine – the National Enquirer – stood out prominently. The shot of the newspaper made no effort of slighting away from the issue of Celebritarianism, as it focused in on the portions dealing with death, so as to exclude the rest of the paper. This was one of the purest examples of Celebritarianism - death packaged and sold to the masses, with the byproduct of martyr making from the remains of the deceased. Brash text revealed "COLUMBINE KILLERS", "photos of their death", "[how] the two gunmen really died", and "never before seen crime scene photos inside", all of which centered around the concept of Celebritarianism; a concept which, while initially outlined in Holy Wood, has been fermenting for many years, and will continue to be explored on Manson's forthcoming album, likely by the Celebritarian Corporation. 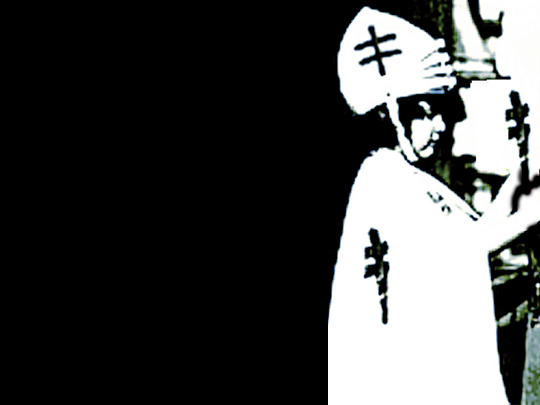 Image contained within the phantasmagoric intro Screenshot from the Personal Jesus video. 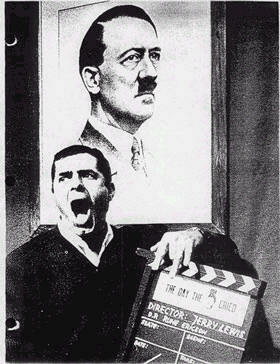 One particular photograph present within the series of images was that of the film set of Jerry Lewis' unreleased movie adaptation of Joan O'Brien and Charles Denton's screenplay "The Day the Clown Cried". TO LEAD HIM ON HIS WAY. AND TAUGHT HIM HOW TO PRAY. THAT HE WAS LEADING ME." 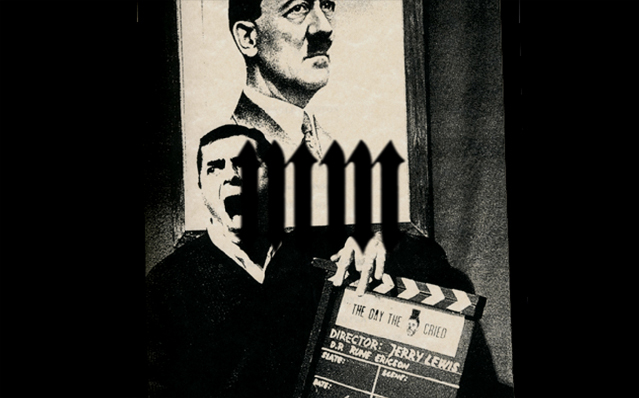 The basic storyline is that of a depressed German clown named Helmut, who finds one of his only joys in mocking, testing, and opposing the views of Hitler, his SS, and his fascist rule. 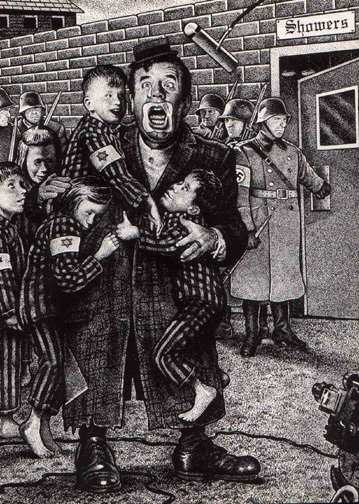 His unfavorable views wind up leading to his detention in the famous Auschwitz death camp, wherein he befriends and tries to protect many of the children there from the horrors of Hitler. When it is learned that all of the children will be killed, and all negotiations have failed, Helmut makes the decision of having the children's final moments be in that of joy, rather than that of squalor. The Day the Clown Cried shares a major concept present also within Fritz Lang's M, a prior identified connection to Manson, which details the plight of a serial killer who ends up seducing children (in his case with balloons, rather than circus antics) to their doom. Also which can be faintly seen, the least visible ring is of a skull and crossbones, the symbol which Manson has been spotted wearing on a number of occasions, both in ring and military patch form, and which once again ties into the thematic element of the Black Death. All of these references are filled with allusions to the tale of the Pied Piper, which is the archetypal tale of child seduction leading to death. 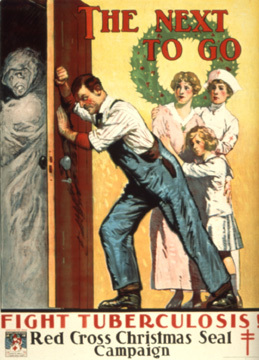 GUILTY AS THOSE WHO THREATEN"
With visible inspiration drawing from two films exploring many of the same thematic elements, such as herding children to their death, it is of importance to understand the original tale in order to better draw the concept and the purpose of Manson for displaying allusions to more recent takes of a similar theme. The story takes place in Germany (both where M, and The Day the Clown Cried were set), and took place on June 26th, 1284. 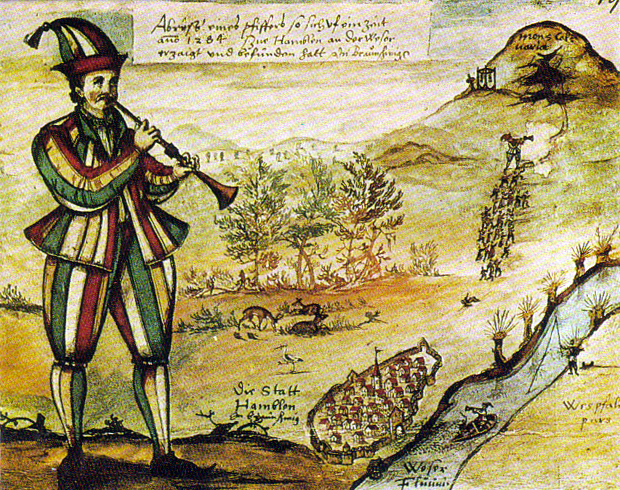 In that year, the Pied Piper arrived at Hamelin, and promised its residents that he could eliminate the rodent problem they were experiencing. In exchange, he asked for a schilling per head for his services, which the town gladly agreed to. He delivered his promise, playing upon a pipe which attracted the rats to him, before heading to the Weser river, and drowning them all. However, the people of the town went back on their original deal and did not pay the Pied Piper, as he did not produce the heads of the rats as proof to his claim. In the most popular version of this tale, the Pied Piper swore vengeance, and later returned while the villagers were in church to lead 130 children to a cave, before sealing it off...the children never to be seen again. A popular historical theory for this tale suggests that the children had contracted an early form of the Black Death, and were led out of town in order to protect the rest of the village. the theme of seducing children and leading them to their loss, and even death as can be infered with the black fangs. Left; A young "knight" decorates Modern Health Crusader General Pershing with the double-barred cross. Photo from Journal of the Outdoor Life, Vol. XIX, January 1922. Source : Johns Hopkins Magazine February 1998. 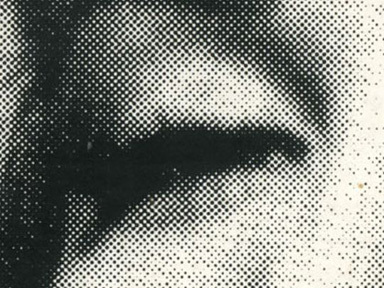 Right ; Image contained within the MarilynManson.com phantasmagoric intro. Note that the cross present on the outfit has been copied and retouched into a wielded hand rood, accentuating the idea of crusading against something. The original Cross of Lorraine on the hat has also been amputated of part of its lower portion, thus becoming a Celebritarian Double Cross. 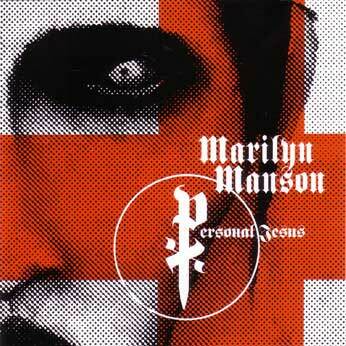 Another dimension to Manson's use of the Cross of Lorraine, or Double Cross as Manson has described it as, is that along the concept of the alchemical union of dichotomies discussed by Boyd Rice to note and its representation of Manson's ethos is that the Cross of Lorraine is also a historical symbol of the fight against tuberculosis. 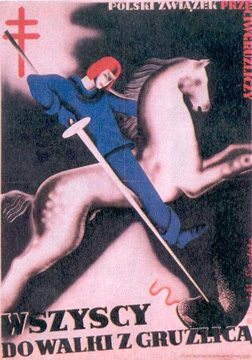 The Cross used in context to the fight against Tuberculosis presumably derives from, in part, the famous allegory of Saint George slaying the Dragon which Manson has previously hinted at within the artwork of the Personal Jesus single. 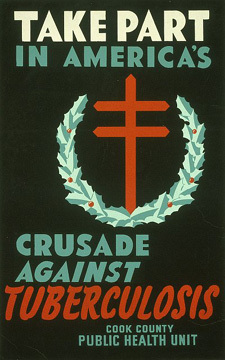 Examples of posters featuring the Cross of Lorraine in the fight against Tuberculosis. Thanks in part to Herr Doktor of MansonUSA and Bullsik of MansonPL.com for some of the images and their origins within this section. 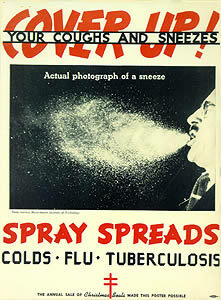 The disease was previously incurable in the days before the advent of antibiotics, much like syphilis, and was subsequently referred to as the White Plague, or White Death, due to the disease inducing a pallor complexion on those afflicted by it as well as the similarity of transmission and its effect on its victim to the Bubonic Plague. 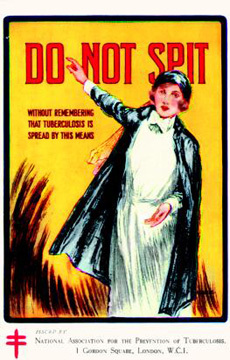 The disease in fact reached such epidemic proportion that sanatoriums (establishments dedicated to the treatment of disease) were set up for those afflicted for quarantine purposes, both to keep outside pathogens out as well as to keep the disease in from spreading further. 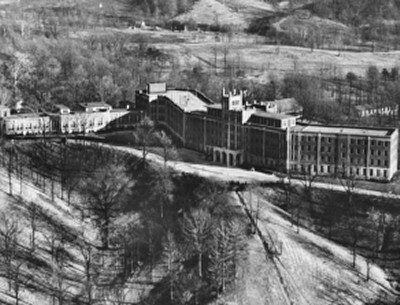 Similar in classification to the trend of popularization of mid Nineteenth Century asylums for the chronic insane, the sanatoriums were the only recourse against Tuberculosis as a treatment. 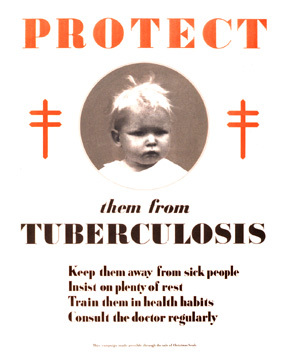 The sanatoriums became synonymous with the treatment of tuberculosis and degenerated into veritable "death houses" because of the disease, with tuberculosis truly being a modern day plague similar to our AIDS today. "Death Tunnel," the tunnel in which the dead were transported from the building. The image which Manson presented of an apparent bishop or priest with the Cross of Lorraine is in actuality a ceremony honoring the American General, John Joseph Pershing, a hero of World War I, who lent his name and support of the American Red Cross, which during the years of World War I the organization was in efforts to stamp out a tuberculosis epidemic circa 1918. 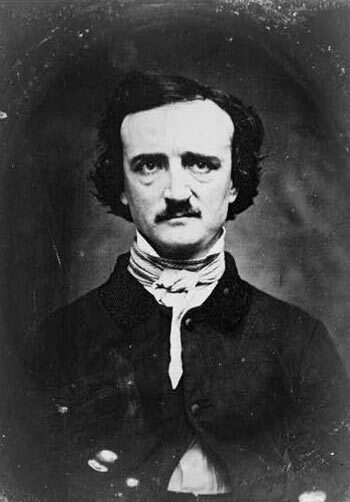 In keeping with interlocking themes of dichotomies, opposites and pallor complexions due to plague, Edgar Allan Poe, whom Manson has been frequently referencing as of late and including dedicating a watercolor portrait too, had lost his wife and other family members to the epidemic of tuberculosis thus fueling his melancholic writings. 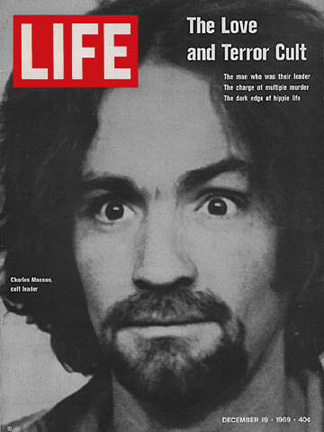 This phantasmagoric montage was replaced four days later, on April 25th, by a multimedia version of the Celebritarian masthead showing Manson with the crown of thorns and MM stigmatist hands. 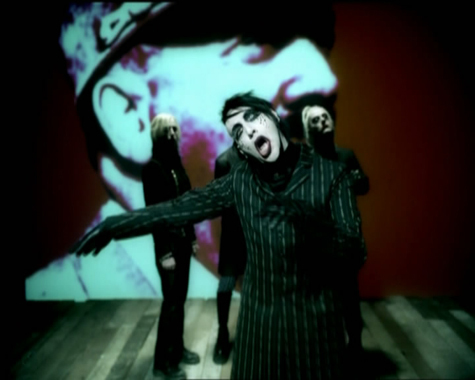 It was however reverted back on May 1st as the main introduction of MarilynManson.com (now clicking the film doesn't direct the web navigator to a news page anymore, but to the main site index itself), which is still active in 2008.